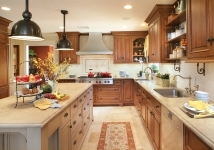 Pennville Custom Cabinetry is truly Cabinetry from the Heart of America. Our American cabinetmakers build every door, turn every spindle, dovetail every drawer, and hand finish every cabinet in our one and only state-of-the-art facility. It is not unusual to have several members of a family who are part of the Pennville team. Some of our craftspeople are even third generation cabinetmakers who have evolved into having as much experience with CAD/CAM equipment as they do with a chisel. In other words to the Pennville team, cabinet making is not only an occupation; it is part of who we are. 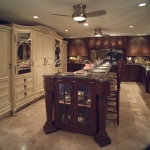 Pennville is a face frame cabinet (for frameless or European syle, see Epicure). In face frame cabinetry we start by putting together the front frame with loose tenons that we recycle out of our left over solid pieces of wood. This face frame becomes the triangulating structure of this type of cabinetry. Face frame cabinetry is not only durable because of this, but it is also the preferred method for certain types of design including inset doors, extended and increased styles and rails, onlays, and the replication of historic pieces. With both Pennville (framed) Custom Cabinetry and with Epicure (frameless) Cabinetry for the Loft & Spa, any molding, wood species or doorstyle is available in any finish and even curved into any radius. 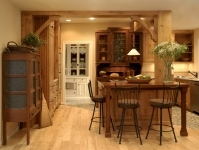 For traditionally built custom cabinetry, Pennville is simply the finest available.